Ever since 1337 the conflict over who is the rightful King of France has been ravaging both France and England for over a hundred years. The English retain control over Normandy and Guyenne while Charles VII in Paris has the support of most of the regional nobles of France. With the treaty of Tours in May, the English Lancasters and French Valois families have seemingly traded territory for peace. Among its stipulation are the handover of the county of Maine, a point that was never cleared with the English Parliament, and which is likely to anger noble and commoner alike on the far side of the channel. The fear of public backlash has so far lead to this handover being stalled for months, with the word of the English negotiators increasingly being questioned in the French court. England is itself in a precarious situation. A king since he was nine months old, Henry VI has now grown up to assume the crown and actual rule of the kingdom. Even as an adult however Henry seems unwilling to rule, some would say he is even worryingly detached from reality. Intriguing nobles of the realm have instead come to dominate Henry's regime, assuming power and positioning themselves for a future succession. Such feuds might well cripple the internal stability of the Kingdom, especially if hostilities in France commence again. With the English busy with continental and internal affairs the dominion over Ireland has shrunken to a thin strip along the sea known as 'The Pale', with Gaelic lords as well as Hiberno-Normans acting entirely independent of the English Crown. There are few if any English troops on the island anymore much to the enjoyment of the Irish. Should matters in London and Paris finally settle however, the Irish lords are likely to be made a much higher priority. After the England 1.25 patch, the new mission chains for England are primarily focused around unifying the British Isles, conquering French lands and India, colonising the Americas and Australia, alongside dominating overseas trade. England has one of the richest and best known histories of all nations, making it a treasure trove for Dynamic Historical Events. If England reaches administrative level 10 and owns Aberdeen and Lothian provinces in Scotland, England can form Great Britain militarily. Doing so grants permanent claims on all of the British Isles (including Orkney). Alternatively, if England has Scotland as a vassal or junior union partner, they can form Great Britain diplomatically, which is how it happened historically in reverse (Scotland gained a Personal Union on England, though with England as the dominant partner). In order to effectively tax things we need to regulate them. If we were to designate Calais as the sole point of import for the wool staple we would improve our tax revenues dramatically. does not have the modifier “The Staple Port”. has at least 40 administrative power. does not own Antwerpen (1744). worth −150 opinion for 10 years with a yearly decay of 1. England can be formed by any country pertaining to English culture and is located in the southeastern part of the British Isles, if England or Great Britain have ceased to exist. Trade has long been a foundation of English national policy. By extending our influence across borders and controlling its political development domestically, we have managed to become one of the foremost European powers. Our colonial expansion is becoming a major factor in promoting our nation's economic growth, reinforcing our position in world affairs. is not the Holy Roman Empire, the Papal States or England. owns its core provinces London (236), Oxfordshire (237), Hampshire (234), Kent (235) and Essex (238). gets a permanent claim on every province in Northumbria, Mercia, East Anglia, Wales and Wessex that it does not already own. England is a large country in a relatively unique position geographically, mechanically and economically as sea tiles separate the British Isles from continental Europe and it controls a significant portion of the English Channel end trade node. Defensively, the sea tiles separating the British Isles require an invader to utilize transports and associated escorts to launch any successful invasion. Few nations early in the game are able to support the combined army and naval costs required to successfully invade the British Isles and defend from opportunistic continental neighbors. Offensively, the sea tiles reduce the aggressive expansion experienced by continental Europe during the consolidation of the British Isles under English rule. Economically, the end trade node of the English Channel provides significant income as the game progresses enabling a strong income to support peaceful colonial or military expansion. 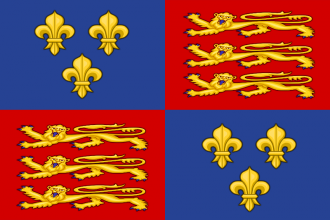 England has a unique government named the English Monarchy and suffers the historical political crisis of War of the Roses fomenting during an interlude of the long-lasting Hundred Years War against France. The English Monarchy has access to Parliament which can vote on issues that provide special bonuses to the kingdom. However, Parliament requires seated provinces to be bribed one way or another to pass issues, which can be a severe hindrance to the monarch. The War of the Roses may determine whether or not England is able to resolve the Hundred Years War over traditionally English territory in the continental Normandy, Gascony and Vasconia areas (bordering France). Startup: England starts the 1444 bookmark possessing 39 provinces, 333 total development, and is considered a great power. The King of England is Henry VI of House Lancaster whose skills are 0 Adm/0 Dip/0 Mil. England begins the game allied to Portugal. Besides its primary culture, England also accepts Gascon and Norman cultures. The English Parliament is composed of 5 seats represented by London, Cambridge, Kent, Lancashire and Oxford provinces. England starts in a very defensible position. Because of the sea separating the island from mainland Europe, the general inability of the AI to handle navies and England's high base development, they are in a favorable and well-defended starting position. After the War of the Roses and the Lollard Heresy events end, England is in a good spot to expand into the British islands, mainland Europe, or the many colonial areas. Additionally, the early-game "Surrender of Maine" event will almost certainly allow it to declare a Restoration of Union war on France. While this event may be used to get an early personal union over France without relying on the mission to do so, the war will be very difficult. England will be able to call in very few allies because of the short available time to build favors, and the War of Roses and Lollard heresy events will add additional challenge to defeating France. The "Surrender of Maine" event, which will almost certainly occur within the first few years of the game, will force you to choose between handing over the province of Maine or declaring a "Restoration of Union" war with France. The riskiest, but most rewarding, approach will be to roundly defeat France and bring them in as Junior Partner. As England is considered the attacker and the player won't have any favors built up, most of its allies will be unhelpful - and France is likely to have a handful of decent allies on its side. The best case scenario is that France fails to find strong allies other than Provence, while the player is able to ally with an expansionist Aragon or friendlier-than-average Burgundy. Since one can't control the AI's rivalries and ambitions, a degree of luck is needed for this to work; you may wish to restart until a favorable setup. If you get one, then bring in several mercenaries - going a few troops over force limit, if necessary - before the war starts; once it does, call Aragon and/or Burgundy in, promising them land to convince them to join. Try and knock Provence (and any other French allies) out of the war early by sieging down their provinces and harassing any small armies in the area; at the same time, be careful not to over-extend, as the English beachheads in the north and southwest are very vulnerable, and one loss can quickly turn into a completely wiped-out army. If all goes well, you'll be able to whittle the French alliance down until you have them significantly outnumbered; at that point, it's just a matter of conquering your way to Paris before cleaning up the remaining territories to force a surrender. Forcing of union in a peace deal will provide a lot of aggressive expansion. Either way (with some luck) is to wait until Burgundy declares war on France/Provence and takes some land from France in peace deal what causes a reduction in France's size. Usually it is enough when Burgundy takes just 1 province to reduce the aggressive expansion under a coalition threat (if France still has only the initial game's number of provinces). Other way is to complete the War of the Roses mission which provides nice -10% aggressive expansion bonus. If this bid fails, or the player prefers to play it a bit safer, then focus should be shifted to a longer game of building alliances and favors. The Portuguese alliance is not very valuable, and should be broken in favor of a stronger nation. By allying a combination of Aragon, Austria, Provence, Castile and Burgundy there should be more than enough land power to counter the immense power of France and their allies. To avoid losing Maine (but avoid war with France, as well), you can release Alençon and grant it ownership of Maine. You could use Normandy for this purpose as well, but that means you cannot release Gascony without getting the event that ends the 100 year war. If England releases Gascony as a vassal, they have cores on a large part of the French development; combined with Alençon, you'll have a strong buffer against France for when you do decide to push. Occupying Paris (or successfully subjugating France as a whole) will grant England permanent claims on Brittany and the Ile-de-France area; conquering Brittany, in turn, will grant claims on most if not all other French territory. Follow the mission tree along those lines and you should be able to chip away at France until it's annexed or irrelevant. At this moment, England should have secured a major foothold on continental Europe and can now look to expand south into the Iberian Peninsula or east into Burgundy and the Holy Roman Empire. Special interest should be given to the lands inside the English Channel trade node, as this will provide England with a large boost to trade income. The rest of the British Isles is composed of Scotland and several small Irish nations. Conquering the rest of the British Isles approximately doubles development of England and thus is a common game opener. At the start of the game, none of the nations can challenge England's army or navy and the Irish are generally busy conquering their rivaling minors. By building up a decent active military and manpower reserve (which is almost guaranteed to happen in normal play, regardless), England can complete the "Levy the Troops" mission to get permanent claims on Ireland and the majority of Scotland. It will also get a time-sensitive Subjugation CB on Scotland; using this to vassalize the Scots will require a bit more forethought than slowly chipping away at the north (as it will generate a good deal of Aggressive Expansion, as well as resulting in a very angry vassal), but will save on time and admin power in the long term by enabling the Form Great Britain Diplomatically decision. Since this CB is time-sensitive, it's recommended not to complete the mission immediately but wait until you're ready to use the CB. Ireland is usually a trivial affair once you have the necessary claims, as the local minors fight among themselves and struggle to find powerful allies or guarantors. Because of their distance from mainland Europe, conquering these counts will rarely cause too much AE to build up, so the only real limiting factors are administrative power and your other priorities. If one or two of the minors start consolidating power, however, you may find it worthwhile to start expanding earlier than planned so that they don't get the chance to become a nuisance. You can save on administrative power and use diplomatic power instead by vassalizing one of the Irish minors and feeding them Irish land, then diplo-annexing them. What remains is to take care of Scotland, which will usually be allied with or guaranteed by France (unless France has already been eliminated). Triggering a war with Scotland generally has severe consequences on continental Europe and England has to be careful of losing its foothold in the French region. However, these relationships can be looked at with trepidation or with opportunity. One example of utilizing the special relationship between France and Scotland is to start wars with Scotland as an excuse to take territory and power projection from France. This method means slow going as the provinces can be twice as expensive and the strategy requires strong allies on the continent, as well as giving a larger amount of aggressive expansion. Another way of dealing with Scotland is by declaring war on an Irish minor allied to Scotland and then making them a co-belligerent. This will allow the player to take the entirety of Scotland in a single war. Colonial England generally is a more defensive choice as it doesn't require direct conflict with continental Europe until later into the game. In this variation securing a strong economic base is vital to rapid colonization. One method is to conquer Scotland using the previously mentioned strategy of declaring war on one of the Irish minors allied with Scotland and including Scotland into the war as a co-belligerent. This will prevent a struggle with France. The challenge with an England centered colonization campaign is that they struggle to reach colonial regions until later technologies. A helpful way to increase England's colonial range is to look toward neighboring Norway and its Icelandic provinces and hiring a colonial advisor. Norway has a few neighboring provinces to the British isles. England can get involved in a war with their suzerain, Denmark, by supporting the independence of Sweden. An advantage to pursuing colonization through a northern strategy is that it confines England to the Northern portion of the Americas, away from the likely Iberian colonies in South America. A second way to increase colonial range is through conquest of parts of the Iberian Peninsula. Early fabrication of claims and rivaling of Castile can enable the release of potential vassals like León ( +1 colonist as level 4 national idea) and securing the provinces of Galicia and The Canaries to put England closer to the colonizable regions of Africa and South America. Notably this method puts England in direct conflict for colonies with ally Portugal and now rival Castile. Recommended idea groups for this direction are Exploration and Expansion. This page was last edited on 14 April 2019, at 11:33.